Interview with guest distance runner, author, Spanish teacher, diversity educator, and “Fat Girl Running” blogger Mirna Valerio. 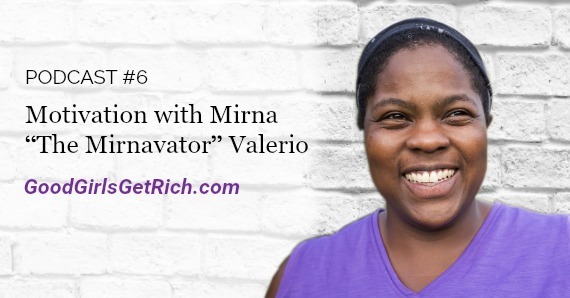 This week, Good Girls Get Rich features guest, Mirna Valerio, a distance runner, author, Spanish teacher, diversity educator, and blogger at “Fat Girl Running”. A self-described “fat” long distance runner. She wants all women to know their worth and to be confident. How Mirna addresses issues of “body shaming,” for instance when she received a horrible message from someone who accused her of being a liar and a fraud at running because of her body weight. She identifies herself as a fat woman participating in ultramarathons, the kind where everyone is expected to be thin. She recounts her health struggles that made her realize that women (and all people) deserve to be looked after. Valerio talks about the Women in the Outdoors campaign, which focuses on the need for women to enjoy activities with nature. The influencer that brought Karen to Mirna. The impact of hurtful words on someone’s confidence. Valerio believes that the job of adults is to educate girls in schools to make them understand that they are worthy, powerful and strong as well as that they are able to do anything. How boarding school changed Mirna from being shy to being confident. Advice for women to create a business and a life that they love.